New Blackstones boss Andy Lodge wants to return the club to the United Counties Premier Division. Lodge, who has been out of football for three months following the withdrawal of Whittlesey Athletic from the UCL, replaced Phil Gadsby as Stones manager this week. Liam Harrold (stripes) in action for Blackstones. Gadsby was controversially dismissed even though Stones are sitting 16th in a 20-team Division One with just six wins from 24 matches. Lodge, who will be assisted by his former Whittlesey colleagues Liam Harrold and Daniel French, said: “I’ve always admired Blackstones as a club from my time playing in the United Counties League. “They were a Premier Division club for many years and I am convinced they have the potential to get back there. “That will be my aim. They have a good squad already and if they all stay I will not need to do much recruitment. Action from a recent Blackstones match. “I needed my three months out of the game. I’m coming back refreshed after a clean break from the game. “I watched a couple of Stones games in that time and they were pretty good. Former Whittlesey players Adam Piergianni and Jack Bates are already in the Stones squad. Lodge starts his new job with a tough home game against sixth-placed Irchester on Saturday (January 7). Gadbsy was disappointed to be axed. He told the SRSN website he had been promised three years in charge, but was shown the door after just 18 months. “It would have been nice to have been given the three years I was promised when I first took the role,” Gadsby said. “The club was really struggling when I took the job. Now they have people approaching them wanting to manage the club. I guess that shows what a good job we have done. “I have to take the club’s decision on the chin and move on from it. Blackstones were hurt by an early-season injury to free-scoring Lewis Leckie. They lost their last Division One game under Gadsby, 2-0 at home to Bourne on Boxing Day. Bourne are at third-placed Olney on Saturday. Elsewhere Holbeach United boss Seb Hayes is working hard to arrest his side’s recent poor run of form. 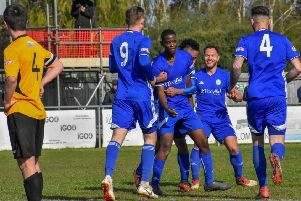 The Tigers have lost successive derby games against Deeping and Wisbech and are now seventh in the UCL Premier Division ahead of a tough trip to fourth-placed Desborough on Saturday. Peterborough Northern Star travel to Oadby in the Premier Division on Saturday, while Yaxley host Rothwell Corinthians.